Armenian police are often accused of planting evidence, and a retired officer told ArmeniaNow that the practice is not unusual. In the case of Kirakosyan, however, the allegedly false charges are believed to be an attempt to discredit him for political reasons. Kirakosyan's wife, Laura, is among those who believe he is being framed. Kirakosyan is head of the National Democratic Union of Baghramyan, one of several political parties that, over the past three months, have staged demonstrations against the current government administration and have called for the resignation of President Robert Kocharyan. The party head was sentenced to 10 days of administrative detention. He did not have a lawyer. Two hours before he was to be released, the court ruled to allow a search of Kirakosyan’s premises, on allegations that he was keeping weapons in his home that belonged to two Yezidies who are accused of violence against the head of a village. Kirakosyan testified that he did not know the men in question. Police searched Kirakosyan’s home. No weapons were found, but they did turn up 59 grams of marijuana. A case has been initiated against Kirakosyan for possession of illegal drugs, for which the sentence on a guilty verdict could be up to three years. Kirakosyan has retained an attorney, who says his client is being framed. Two residents of Kirakosyan’s neighborhood who were brought along on the first search as witnesses, say police coerced them to sign a document verifying that the marijuana had been found in a water heater on Kirakosyan’s premises. “When they first entered the house they searched the water heater but there was nothing there,” Misha Shmavonyan, a neighbor who police asked to witness the initial search, told ArmeniaNow. “Then they searched different rooms and cowsheds. One policeman together with Gevorg (another search witness) climbed onto the roof and searched there. They found nothing. They returned to search this place (the water heater) again. On a second search, a white package was found. Inside the package was 59 grams of marijuana. Kirakosyan's brother-in-law shows were drugs were found. Shmavonyan says that, although a plastic vase found in the same place was covered with dust, the package containing the marijuana was not dirty – proof, he believes, that it was put there just moments before police claim they found it. Police produced a protocol of the search, and demanded that the men to sign it. Kirakosyan’s sister, Gayane, says she saw police plant the package. Investigator Seyran Martirosyan refused to answer ArmeniaNow’s questions about the search. After the search Kirakosyan was taken to Republican Narcological Center where his urine was tested and found to contain traces of marijuana. Chief of Laboratory of the Narcological Center Svetlana Minasyan, who detected drugs in Lavrenti's urine, says he probably used drugs before being arrested and that traces can last up to three weeks in the blood system. Kirakosyan’s neighbors defend his innocence, saying that they’ve never even seen him smoke cigarettes. But the drug specialist says marijuana can be cooked and ingested in food or by drinking as tea, as well as smoking. Lawyer Vardan Zurnachyan says the day before taking a urine sample, Kriakosyan was served cutlet and bread in the police department and after eating he felt bad, threw up and felt dizzy. A doctor from Baghramyan polyclinic came and gave him an injection. Kirakosyan’s relatives believe his illness was a reaction to marijuana suffused into his food by police. They say either police put the drug in his food, or else the test was faked. There is no answer to investigators’ question whether Kirakosyan has ever used drugs. His sister says she watched through the door while police planted evidence. His legal past, however, is not as clean as neighbors might suggest are his living habits. 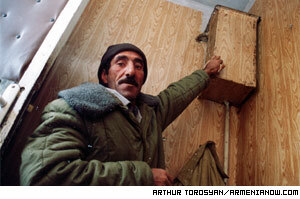 In 1996 Kirakosyan was accused of keeping a bomb in his apartment and was sentenced to six months of imprisonment. Deputy Head of Baghramyan Police Department Perch Khachatryan refused to comment on Kirakosyan’s case. He would only say that Kirakosyan had a previous conviction and that a policeman could not practically hide 59 grams of marijuana on his person, as the package would be too noticeable. Lavrenti Kirakosyan graduated from the Yerevan Polytechnic Institute. He has three children, including a son in the army. For a living, he breeds cattle. 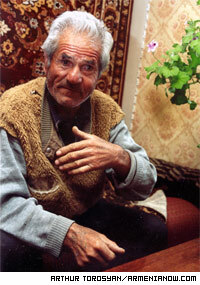 Residents in his home of Karakert praise him as a community leader. Some 1,500 have signed a petition calling for his release. Kirakosyan was also arrested for 10 days during last year’s demonstrations against the presidential elections. With the help of the head of the International Union of Armenian Lawyers Tigran Ter-Yesayan, Kirakosyan sent an appeal to the European Court for Human Rights in Strasbourg , France appealing an Armenian court’s decision on administrative imprisonment over last year’s arrests. It is mentioned in the testimony that after the search, the deputy head of Baghramyan police department promised Kirakosyan to set him free on condition that he would give up his political activities. The investigation on the drug charges has been completed and sent to court. “Consistent political persecutions are conducted against Lavrenti,” says his lawyer, Zurnachyan, who has taken Kirakosyan pro bono. “He is arrested as if he demonstrated disobedience of a policeman’s demand. Zurnachayn says the police denied his request to examine the men whose guns Kirakosyan was allegedly keeping.